The Mint Act of April 2, 1792, established the United States Mint and a bimetallic coinage system based on the silver dollar and the gold eagle as the primary monetary units of the nation. However, the silver dollar was not coined until 1794. It might have appeared sooner had it not been for the $10,000 bond required of Chief Coiner Henry Voigt and Assayer Albion Cox. When neither Voigt nor Cox could post bond, they were denied permission to handle precious metals, making it impossible for the production of gold or silver coinage to go forward. The first Director of the Mint, David Rittenhouse, used his influence with Secretary of State Thomas Jefferson and President George Washington to reduce bond to $5000 and $1000 respectively, amounts both could post. On October 15, 1794, a total of 1,758 silver dollars were struck on a manually powered coin press. This proved to be the entire mintage of the 1794 Flowing Hair Silver Dollar. Rittenhouse took possession of entire group and personally distributed them, keeping at least one for himself (see below). Most of them ended up in general circulation. Today, the 1794 Flowing Hair Silver Dollar is celebrated as one of the greatest coins in American numismatics. Of the original mintage, perhaps 8% are known to survive. Intense pressure from collectors virtually guarantees 1794 silver dollar prices to remain on a steep climb. On May 14, 2010, a 1794 Flowing Hair Silver Dollar sold for $7.85 million. It is in near perfect condition, and is believed by many scholars to be the very first U.S. silver dollar to come off the coining press. This fabulous coin was taken into protective care by Director Rittenhouse and carefully guarded for many generations. On January 24, 2013, this exact same coin sold for over $10 million! The 1794 Flowing Hair Silver Dollar is one of the most historically significant coins in American numismatics. It was the first year of the dollar, the monetary unit of the United States, and was produced in very limited quantities. Collectors pay big money to own a 1794 silver dollar. Take a look at the chart above. The blue line depicts the percent price increase of the 1794 silver dollar since Year 2000. It is completely off the charts. You can't see it, but in 2008-09, it reached 12.5 times its value, compared to what it was worth in 2000. It has receded since its all time high, but it is still fair to say it has increased in value many times over the last decade or so. The red line charts the progress of the Rare Coin Values Index, which takes the combined percent change over time of a pre-selected group of 87 rare US coins, the purpose of which is to understand the strength and direction of the overall rare US coin market. The Index uses Year 2000 as a baseline. 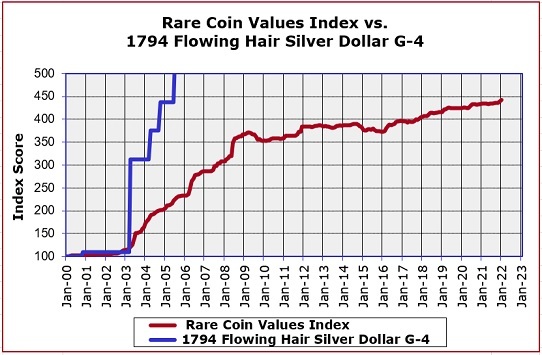 The 1794 Flowing Hair Silver Dollar is one of the 87 coins included in the Index.